Earning a scholarship gives a measure of encouragement to students, building their confidence. Our experience suggests this has as much value as the financial benefit. This collection of letters from some of our scholarship recipients, demonstrates their depth of gratitude to their sponsors, and shows how the Whitireia Foundation is making a difference. My name is Rebecca Tufuga and I am the very surprised, yet extremely elated, recipient of a Whitireia Foundation Scholarship in 2016. A simple ‘thank you’ does not come close to expressing how utterly stoked I am at having been granted this scholarship. Yes, it is it a substantial chunk out of my study fees for the year and for that I am sincerely grateful. But for me personally, it is the fact that out of all of the applications you received, you picked mine. I know there would have been ample applicants with better stories and bigger achievements than mine however, you took a punt on an outsider and for that I will be eternally thankful. Be assured that your support will serve as ongoing incentive to push myself and give 110% throughout my studies. Last but certainly not least, I would like to thank you for saving me from divorce and a life of crime. I must admit, I really wasn’t looking forward to either. So…thank you, thank you, thank you and thanks again. You guys rock! 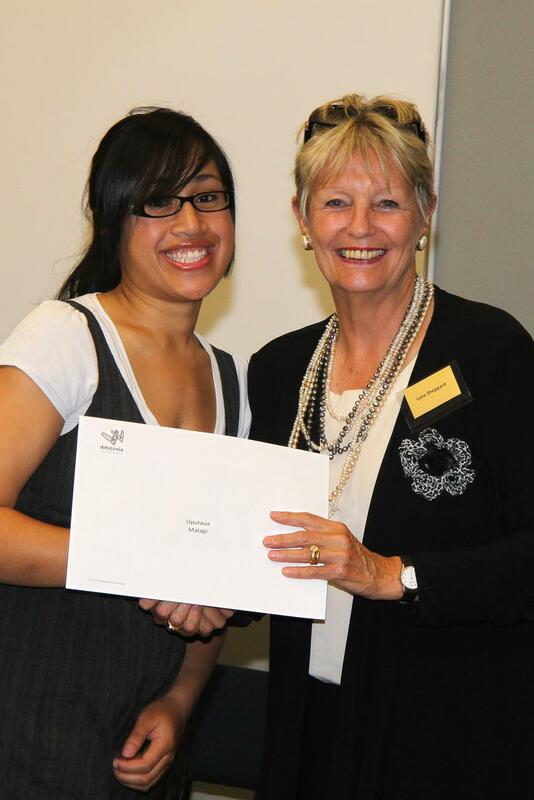 I was very happy and excited to learn that I was a recipient of the Trust Porirua scholarship for the second time. I am writing to thank you for your generous, financial support towards my higher education. I was planning to write at the end of course when the results come out so I can attach with this email. I am currently studying for a Bachelor of Applied Business Studies first year first semester and it is a big step for my life. I am planning to study as much as I can or until I am confident enough to manage our own business, mine and my husbands. We are planning to have our own a business in the future. I would like to work and save money until we can manage this dream. I would like to be able to organise all the paper work and all business documents at home office while raising my children. By awarding me the Trust Porirua Scholarship, you have lightened my financial burden which allows me to focus more on the most important aspect of school, learning. Your generosity has inspired me to help others and give back to the community. I hope one day I will be able to help students achieve their goals just as you have helped me. The writer achieved amazing results in her exams – we wish her and her family every success. 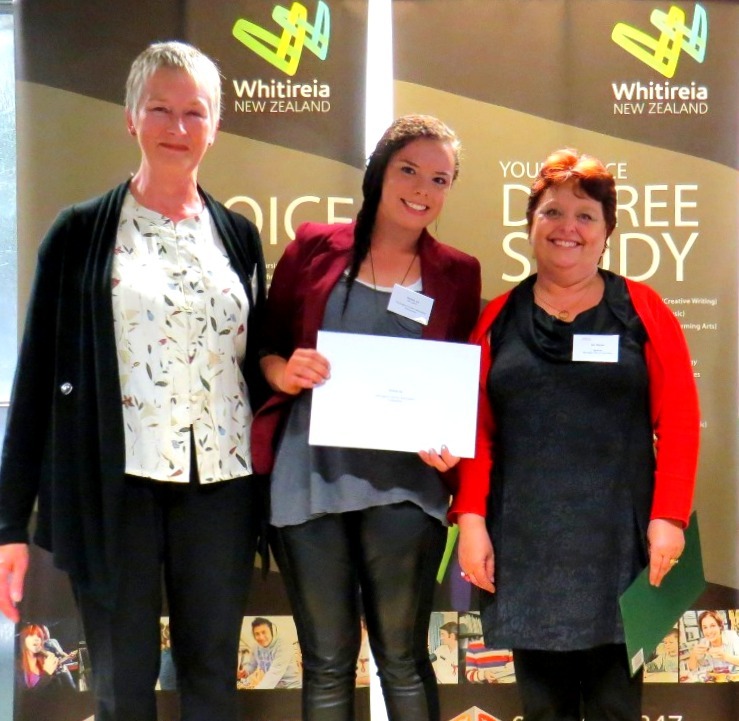 Porirua City Council sponsors a local student every year. Mayor Mike Tana awards Samrawit her scholarship certificate at the ceremony in March 2017. I am honoured to be one of the recipients of the Whitireia foundation scholarship in 2017. Thank you for your generous support; I am the first in my family to attend a Bachelor of Nursing course. I have just begun my nursing course as a freshman at Whitireia Polytechnic. My plans at this stage are to complete the first‐year nursing course successfully. The scholarship award pushes me further towards my nursing degree and my dreams of one day having a successful career as a nurse. I enjoy helping people by sharing the knowledge that I have got from the nursing course. In addition, I will respect my patient’s human right, values, and culture. Once again thank you for enabling this opportunity! I would like to take this opportunity to sincerely thank all of those involved in Trust Porirua and the Foundation, for allowing me to study in 2017 at Whitireia Polytechnic. I feel humbled and extremely lucky to be able to begin achieving my goal of becoming an IT Professional. This Scholarship has allowed me to be able to achieve more than I ever thought I could, and I will strive towards providing the results required in order to continue to do so. Thank you, Trust Porirua, for enabling people in our community to achieve our objectives when we otherwise would not have the ability to do so. 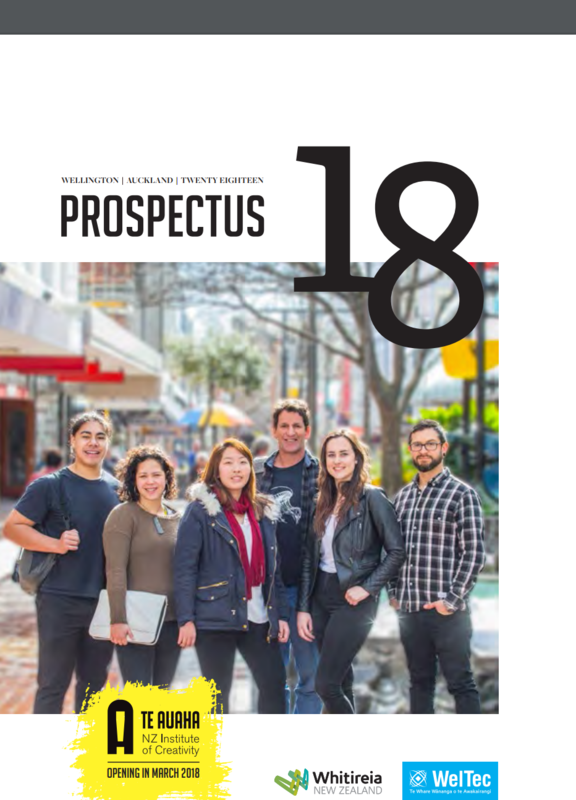 Kia ora for sharing this Krystal, fantastic to see our local people move into the world of IT and achieve success for themselves and their whānau. I would like to express my sincere appreciation as a recipient of the Kaylene Te Roha Kahurangi Tareha-O’Reilly Scholarship. Your financial support will help me achieve my goal towards my Bachelor’s degree in Nursing Māori. As a mother of four children, I am determined to achieve a successful nursing career. Becoming a Registered Nurse will not only secure a better future for myself but also for my children and encourage my whānau to never give up on your dreams and goals. My nursing journey is to improve the health and well-being of all those I come into contact with. The attributes I bring to my journey as a Nursing Student is to show kindness and empathy, listening to patient concerns, imparting a sense of self-worth to those in need. These principles I will continue throughout my future nursing career. Once again, thank you so much for helping to make my dreams become a reality. Shannon’s lecturers report that she is excelling at her studies and ‘gaining as much from the clinical learning experience as possible’. The following article was written in March 2016 by former Whitireia journalism student Samantha Pardo and edited by Fransceca Hilbron. Arama is a recipient of a Fuji Xerox NZ scholarship. Fuji Xerox is a company that lives by its values, transforming outcomes through social responsibility. Gifted carver and final year student of Whitireia’s Bachelor of Applied Arts (Toi Poutama), Arama Wineera, can attest to this. 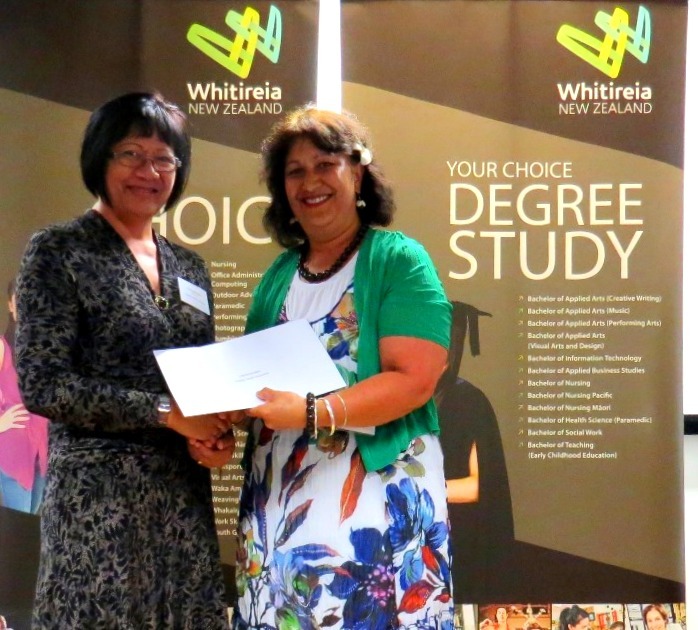 For the third year running, Arama is a recipient of Fuji Xerox NZ’s scholarship administered by the Whitireia Foundation. Arama says the scholarship has been crucial in his return to study at Whitireia Community Polytechnic. The scholarship changed my life, not having a mounting student loan is a help to anyone isn’t it? says Arama, who firmly believes the support from Fuji Xerox has been a tremendous help to him. This support extended to the purchase of new carving chisels for Arama, but the relationship is clearly two-way. Fuji Xerox Strategic Account Director, Jamie Clarke, says while his company supports a number of organisations, community groups and education providers, Arama and the Whitireia Foundation really stood out. Arama’s relationship with Fuji Xerox has grown to beyond that of a scholarship recipient. He has introduced us to other members of the carving school who have become new scholarship recipients, Jamie says. He is a hardworking, honest and talented man, who we are delighted to support as he grows in his skills and passion for the arts. A symbol of the relationship proudly sits in the Fuiji Xerox Wellington reception – the office of a prominent multi-national company. Arama applied his study of traditional Māori carving by making and gifting a special piece to Fuiji Xerox to acknowledge his deep appreciation for their support. Carving has provided Arama with an important opportunity to expand his culture and commitment to Māori tradition. The scholarship has allowed Arama to follow his dream, from tutoring on a Whitireia STAR programme and completing a full arts degree. Arama says that all his tutors have had a strong and positive influence on him, supporting him to better understand the craft and to also invest more time in it. Born in Porirua, Te reo Māori was an important part of Arama’s life while growing up, strongly influenced by his mother who hails from Ngāpuhi. His chosen place and programme of study are an ideal reflection of Arama’s own history, and also his future. His advice to other students is to have people around you who will support you in what you want to do. Arama urges anyone holding back on applying for a scholarship for whatever reason, to have a chat with Whitireia’s scholarship advisors. The Whitireia Foundation and Fuiji Xerox wish Arama all the very best. This relationship shows us clearly what is most important. It is with extreme gratitude that I write this letter of thanks to you. My name is Emma Millanta and I am the proud recipient of the Sheppard Family Scholarship 2012-2014. Thank you so much for your support. Scholarships such as the Sheppard Family Scholarship are the rewards that make quality education possible for hard-working, ambitious students like me. I am grateful for your kindness and your involvement in the promotion of success in the lives of students at Whitireia. I am in my third year of my Bachelor of Nursing degree at Whitireia and plan to pursue a nursing career in the near future after I graduate. I am extremely excited and looking forward to graduating at the end of this year after three years of hard work. After graduation, I will seek employment at one of our local public health care settings with hopes of inspiring other student nurses in the field. I am looking forward to starting my career in nursing and have been inspired by donors such as the Sheppard Family trustees who make it possible for students to feel supported and strive for success in education. By awarding me the Sheppard Family Scholarship, I am able to concentrate on what is important for me, education. Your generosity has allowed me to be one step closer to my goal and has inspired me to help others by giving back to the community. I hope one day I will be able to help other students achieve their goal just as you have helped me. I firmly believe that a person can be the most intelligent person in the world, but without the support and love of people who care, that person would have nothing to fight for in life. Thank you again for being a part of the support and my journey that reminds me that I do have something to fight for and reminding me that success matters. Please be assured that I will keep your trust in mind. Hoping my success will reflect brightly upon your generosity. I am just writing to say a very big thank you for my scholarship. Please pass on my thanks to everyone else at the Wellington Ostomy Association. I will be using the book money for my textbooks next year, (2nd year of Batchelor of Nursing) and it will be a huge stress off me to already be able to pay for them. They are very expensive!!! It is so encouraging for me to have your support and best wishes as I study. What a perfect coincidence that I am caregiver to a tetrapolegic with a colostomy. It was great to meet you after the ceremmony and get to know you better. It was a pleasure to meet you the other night at the Whitirea Scholarship Presentation. I just want to thank you and your team again for the amazing scholarship you have gifted me. Your kindness is going to help me during my busy year of study. I really appreciate your generosity. I would love to stay in contact with you and your team over the year to keep you up to date with my progress. I also want to assure you of my dedication in this my first year of three which will see me complete my Bachelor of Arts in Music. Hi, my name is Stuart. I’d like to start off by saying thank you for selecting me to receive one of your grants :D. I’d also like to thank Eleanor Cater for presenting me with the certificate at the ceremony. I’d like to tell you a little bit about myself. I’m originally from the Hawkes Bay in a small town called Wairoa. I have lived there most of my life. I then moved out of home at 18 to start out on my own. That took me to Hamilton where I scored my first job as a general hand at a motor bike shop. I’m telling you this because this is what started my love for carpentry. Not working at the motorbike shop but 13 months later when I was made redundant lol. I ended up signing up to Tradestaff. I then worked as a labourer on construction sites and engineering sites and thoroughly enjoyed it. A high school friend then persuaded me to move down to Porirua […] I was one of Tradestaff’s most reliable Labourer’s. doing 50+ hours a week, so I moved down here and ended up working at a shop called uncle bills. I have been there over 3 years and have enjoyed the stable income but as of last year I told myself I was going to study carpentry. So I payed off all my debt and sold my pride and joy (my honda lol) and here I am :D.
I’m loving every moment and having no regrets. I’m still working at uncle bills 2 days a week at the moment for that little bit of extra stability, but I’m planning on dropping down to 1 as I have just signed up with New Zealand Labour Hire and am knocking out my 200 hours of work experience, at the moment I’m down to 182 :P.
[…] for the near future I plan on passing everything on this course and jumping into an apprenticeship afterwards. From there I would like to climb as high as I can an expand my knowledge as far as possible. So I can tell you this.. I will become a builder. I might possibly become a foreman.. but for now. I’m focusing on here and now and I’d like to thank you one more time for investing in me 🙂 […] I’ll give you an update at the end of the year :D.
Caroline Komene is completing a Bachelor of Nursing Maori. Compass Health is her sponsor. The scholarship evening last Tuesday was a beautiful event to attend. 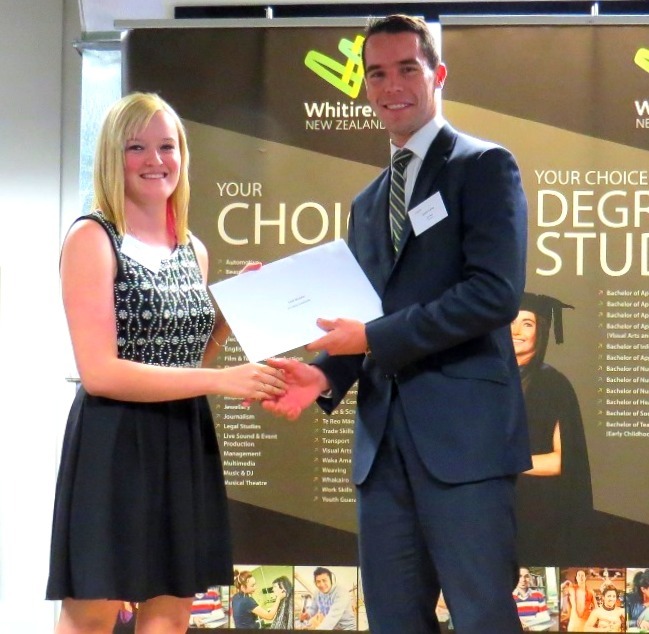 I would like to firstly thank The Whitireia Foundation trustees for selecting my application for a scholarship. On receiving my email without opening it I initially thought I had a library book I hadn’t returned and after hunting through my study room finding nothing decided I should actually open and read the email. I was ecstatic to find I was a recipient for one of the many scholarships that the foundation has a tireless job of selecting. I wasn’t able to share with my family straight away as they were asleep and I had just arrived home from my shift late at night. I would also like to thank Wikitoria Tehuruhuru Katene Whatu whose name I shall carry in my heart as I continue my journey as a Maori nurse. I feel humbled accepting this particular nursing scholarship as Wikitoria has wrapped her arms around me every time I entered the building named after her and now I have been chosen to accept an award named after her, I feel very privileged. I would also like to thank Compass Health for sponsoring this scholarship for without your generosity my loan would take a bit longer to pay off, however this has allowed me time and space to think about continuing my education towards postgraduate thank you for this opportunity. I will be forwarding a copy of my transcript to you soon and at the end of the year my results from state exams. Finally I would also like to thank my Tutor Vicki Simon who gave me courage to open the door of challenge and fired up my passion for reading once again. What do I have planned for the future? I am presently on Practice for Registration with Corrections at Rimutaka Prison and thoroughly enjoying the challenges that this environment presents. Where do I see myself? I have visualized myself working in either a prison environment or with Te Ornanga Hospice whom I work for casually as a Healthcare Assistant. The attraction, they both have patients that are on the fringes of society (not a lot of people want to hear about the dying or dead and nor do they want to know about offenders). But for me these places bring rewards much greater than you could ever imagine. I am focused at the moment on what I need to achieve on placement and continue revision study towards state exams. I am confident that my exemplar at the end of my nine week placement will hold me in good stead for future employment. A final and sincere thanks must go to all who remain behind the scenes and have been party to my continued Maori nursing journey. I am writing to express my gratitude for your kind donation and let you know some details about myself and my plans for the future. I intend to put in as much hard work for my final year, as I have in every other year I have studied at Whitireia. As I stated at the awards ceremony, it’s not just receiving the funds that is rewarding, but also the recognition of all the hard work I have put in. This year for my body of work I am recording an EP of six original songs and will be marked on my recording techniques. I will spend much of the year researching and working on various recording techniques. I will present a report on my progress mid-year, and aim to have recorded all my basic drum and bass parts by this point. I am also learning the mandolin as a second instrument for my degree. This will require a lot of work, as I am new to the instrument. I plan to form a bluegrass group to play at weddings and other functions next year, utilising the skills I will learn in 2012. In addition to study I will continue to teach private guitar lessons, play gigs with my originals band Fire Danger and most likely take on a number of other musical projects throughout the course of the year. Thank you again and I look forward to updating you on my progress later in the year. I would like to thank you for selecting me as a recipient for the 2012 Gwen Price Wellington Ostomy Association scholarship for textbooks. As you are aware, textbooks are slightly more expensive than your average fiction paperback; they are also necessary yet invaluable resources for students. The costs involved in being a student are on-going and the assistance you have provided is not only appreciated, but makes a big difference. Going from a relatively well paid business account management role in corporate telecommunications to a full time student nurse with a toddler is a big change in life, yet I think this makes me more determined to succeed. My grades so far have been excellent and I look forward to updating you on my progress throughout the year. Thank you again, I will be in touch. 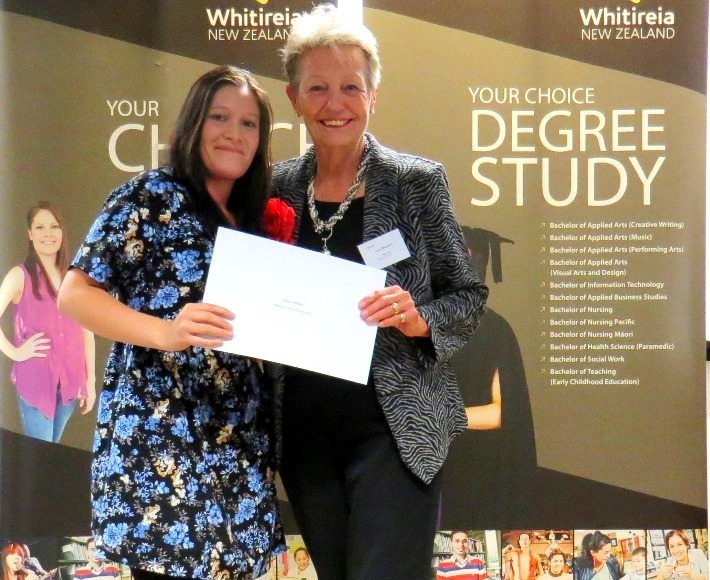 I would like to extend my thanks to those responsible for the Gaze Commercial Scholarship, which I received at the Whitireia New Zealand scholarship presentation ceremony on 3 April 2012. This scholarship will go a long way to help me with purchasing textbooks, uniform, and overall study costs. It has been an honour to receive this scholarship and I am proud to tell friends and family about my success in receiving it. Once again thank you for your generosity in supporting me as an up-and-coming paramedic in New Zealand. It is exciting to know that I only have eighteen months to the end of my Bachelor of Nursing degree. I find that my second year is major step up in terms of less support from tutors and more self-directed learning. This is something I have trouble with when juggling family life and work. I do however have a lot of confidence on my placements; I will be off again on a four week placement in two weeks. This is something that makes me excited to finish my degree; it gives me an opportunity to put all theory into practice. Thank you for giving me this great gift. I would just like to let you know a little bit about myself and my goals for the future. First of all, my full name is Moanaroa Keri-Mei Aniela Zagrobelna. The first two names are Maori and come from my grandmother’s side of the family. In fact, my Nan, mum and me all share this name. The last two are Polish and come from my grandmother who was a child refugee from the 2nd World War. Although I have a Polish ancestry, my mother was actually given to my Nan in aroha and my biological grandparents are both Maori and live in Te Puke. I am an only child with no siblings…I was predominantly brought up Maori, going to Kohanga, learning te reo and helping my grandmother in the kitchen and at the Marae. School is rather hectic at times and this year has been no different. It has started off on a good busy note. I was approached for an exhibition, gained the scholarship, and was asked to run for the student council elective. Along with this, we have the jewellery showcase coming up in September and I have been approached to be part of a Matariki fashion show. On the side, I am making a piece for a charity auction to fund-raise for the Christchurch earthquake appeal, helping my friend paint a mural for Newtown school, and seeking out any community events that I could volunteer for and contribute to. My body of work this year is based around identity and belonging. There is a very strong wahine influence and base, but I don’t want to limit this just to females, as I think children, especially orphans, boys and girls, are very important. They need to be cherished and protected, so that they don’t have to go through some of the hard lessons that I have had to. ‘Belonging’ being the key word here, I think that many of us wonder at some point where we ‘fit’ into society. I am very excited about this body of work and have been up researching late into the night, drawing, painting and making. Along with this, I am also very passionate about our environment and how we treat it. The other day, I went down to Porirua harbour to collect rubbish. There was so much and it was heartbreaking to see. From the collection, I made a ring. I hope this makes people think about what they are doing to each other and our land. Here is a picture of the piece I made. The weaved basket is made of recycled copper. 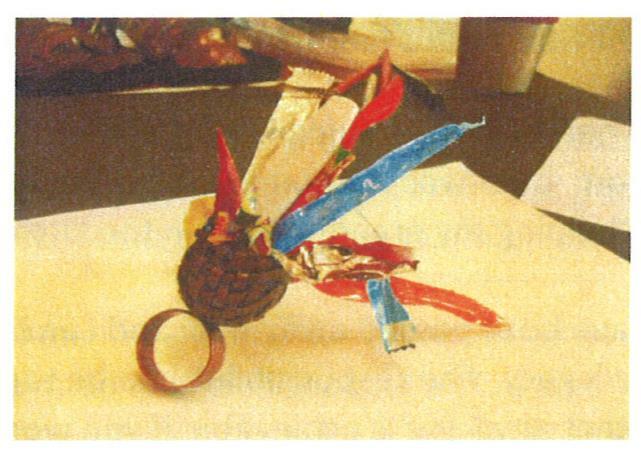 It represents how we use kete to collect our kai moana. It is filled with rubbish. Ironically enough, it is all food rubbish, and all from our poor harbour. I am looking forward to this year and all it has to offer and keeping you updated with my progress. I would just like to say thank you again for helping me and giving me new extra strength to keep pushing forward.